In close games many times you'll see a questionable call by a referee help to decide the game. More often than not that quesitonable call is a judgment call by the referee that could be called either way and is usually argued as such depending which side of the call you're on. Then you have incidents like in today's game and you get offside calls that are blatantly wrong. KC defender Ike Opara had a legitimate goal ruled out due to an offside call that live looked totally wrong and on replay looked worse when there are at least 3 DC players between Opara and the goal (and potentially a 4th even with Opara depending on how you view the angle). PRO Executive Director, Peter Walton said it was "clearly a wrong call and one that cannot be justified." Meanwhile the referee himself, Matthew Nelson said he "misjudged the play." In the end the call helped to cost Sporting Kansas City 2 points as they and DC played to a 1-1 draw. And while there's no way to tell how the rest of the game would have gone if the goal had counted it's a frustrating situation with the game ending 1-1. KC had a strong start to the game, pushing the game and putting DC on the back foot. It was DC on the counter though that created the first really good chance of the half in the 10th minute. After a cross was played back to an onrushing Nick De Leon, the midfielder fired a shot from outside the box that Jimmy Nielsen just palmed into the air and out for a corner, not attempting to hold the ball. KC kept pushing and in the 30th minute came the controversy. Off a corner the ball ended up wide with Seth Sinovic. 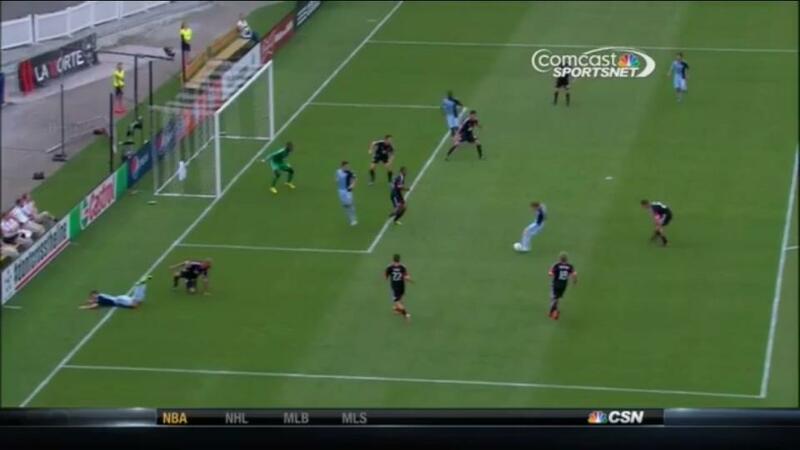 Sinovic played the ball to Matt Besler who was racing towards the end line. Besler cut the ball back into the path of Jacob Peterson. Peterson played the ball to the back post where Opara had made his run. Opara tapped the ball into the net but was wrongly ruled offside and the score remained 0-0. KC tried to find a goal before half, Graham Zusi forced a decent save out of Bill Hamid in the 39th after DC turned the ball over in their own end. As the half wore down it was acually DC who almost grabbed the lead heading into the half. A deep cross made it into the box where Dwayne DeRosario found himself unmarked. DeRosario tried to head the ball back towards the near post, but put his header wide keeping the score 0-0. KC continued their search for the first goal in the second half but struggled to create chances. Finally in the 60th minute they found it. Off a Zusi corner kick, Opara ran into the box and got a touch on the ball and deflected it onto the head of Ethan White who headed it past Hamid and into his own net to make it 1-0 Sporting. The lead only lasted 5 minutes though as in the 65th DC was level. Chris Pontius played a fantastic cross to the back post for Kyle Porter who one timed an effort into the far post past Nielsen to level the game at 1-1. After giving up the equalizer Kansas City again was pushing the game looking to retake the lead. A great ball into the box in the 77th minute. Opara knocked the ball into the middle where Claudio Bieler dummied the ball, unfortunately no one had made the run to the back post. Off the ensuing corner the ball ended up at the back post where Opara and Kei Kamara had cracks at the goal but saves by Hamid and the DC defense kept the score 1-1. DC came right back down the field off a long clearance from Hamid and almost took the lead themselves. The ball ended up at the feet of Porter who raced into the box and fired on Nielsen who made a good kick save. KC in the 81st had one of their better chances as a Zusi cross was knocked back to the top of the box to Bieler who fired a shot on goal that Hamid did very well to get down and tip around the post. Bieler could have had another chance or two but Bieler and Kamara both made the same runs a few times and Kamara ended up with the effort instead. KC pushed but couldn't find the winner their arguably deserved and had to settle for a point, leaving KC 1-1-3 against the bottom 4 in the East while they're 4-0 against the top 5 currently. KC is playing well against the opponents they should but more often than not appear to be playing down to the level of their competition when teams in the lower half of the table. Wizards Man of the Match - Ike Opara - Created the own goal and wrongly had one of his own ruled out. He also did a very good job of shutting down DC's attack. He's proven over the last few games that KC shouldn't have to worry too much when Besler is gone with national team duty. Player Ratings - Nielsen 6, Jerome 6, Besler 6, Opara 7, Sinovic 5, Nagamura 6, Joseph 6, Fielhaber 5, Peterson 5, Bieler 6, Zusi 7. Subs Olum 6, Kamara 5, Gardner 5. Take a look at the Vermes era. How often has he faced the celler-dwellers and not gotten the 3 points. We seem to give up points (charity) to those teams every time???? Kamara at a 5 is VERY generous. Kei just hasn't been good since he returned. Most disappointing was the way he gave up on the play after he made a bad centering pass. DC countered and almost score. Youth soccer 101- don't give up on a play and if you give it up- GO GET IT BACK. CheezWiz, you nailed it. Vermes just doesn't get the same effort out of his guys against bad teams. It's maddening.